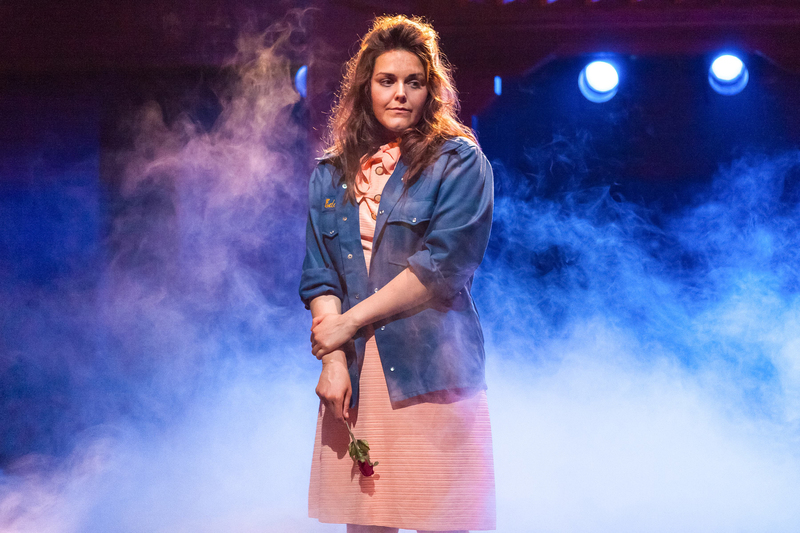 After premiering at Second Stage, New York City, with outstanding success, Dogfight has finally ventured its way overseas to the Southwark Playhouse for its stunning European premier.The premise of this unusual romantic tale is based around the leading lovers falling for one another after a disastrous date at a Dogfight. A ‘Dogfight’ is an immoral contest between Marines, where each man pitches in around $50, and with that money they are able to rent a bar or club, and whatever’s left over goes to prize money. The aim of the competition is to find yourself an unwitting ‘dog’ – quite simply the ugliest girl you can find – and get her to come with you as your date. The man with the ugliest date wins. There are specific rules for the Marines to abide by in a Dogfight, and they follow as such: They must be polite, they must buy the girl a drink, and they must dance if they want to be judged in the final judging. Matt Ryan’s provocative production of Dogfight has a minimalist set, of which most scenery is brought on by the characters and ensemble, with the exception of the faux, rust coloured bridge that accentuates the actors’ entrance to the stage, and also provides a stable platform for the musicians who remain in clear view throughout the play. Jamie Muscato (The Light Princess, Rock of ages, Les Miserable’s, Spring Awakening) stole our hearts as the cocky ‘Jar-head’ with an underlying sensitive uncertainty, reducing most of the audience to tears with several beautifully acted intense emotional scenes, and an incredible voice to match. Laura Jane Matthewson wowed the crowd in her debut role as victim and love interest, Rose Fenney, with expressive tones and wonderful use of acting through song – something that Matthewson has previously won the Ronald William White Prize for whilst studying at the Royal Academy of Music. Review written by Kitty Harper.